Fabric Mart Fabricistas: Made by a Fabricista: Pattern, Texture and a New Dress! Made by a Fabricista: Pattern, Texture and a New Dress! Sometimes great things happen when you mix patterns and other times, you just don't get what you expected, right? I love these fabrics, I am just not sure I love these together.... what do you think? The watercolor wavy stripes was from the April Julie's Mailer and not only is it beautiful, but it was just luscious to work with! It did everything I asked it and more! That's a bonus in my book. I used two patterns that I have been previously acquainted with. One is McCall's 7122, a GREAT dress pattern that is more fitted in the bust area and then falls from there into a lovely and graceful line at the hem. Julie suggested this pattern for this fabric in her flyer and she couldn't have been more right! It is perfect! And, you don't even have to stress over matching the stripes since they are wavy and somewhat uneven. It was a little windy while we were taking photos! I had wanted to make the maxi dress, but the stripe repeat is almost a yard so I simply didn't have enough to make it longer without attempting to have some sort of order to the stripes. But I like the length, it will be perfect for the upcoming hot summer days we hope to have soon! To top this off, I choose this lovely coastal blue poly crochet-look lace. Isn't the color just lovely? I had hoped there would be more blue in the striped fabric, and it appeared on my computer screen they would coordinate perfectly, but sometimes you can have just a little too much pattern. I do really like the lace, it was very easy to sew with and my choice of McCall's 6708 cardigan worked great since it had minimal lines and I left if without embellishments such as no pockets or buttons, or even a contrasting band! I didn't want to use any interfacing with this as it would show through. I was a little worried at how it would work, but I think it turned out great. This is just enough structure for this cardigan and it worked! Now after I sewed both pieces, I decided I didn't really care for how they looked together in person, but now that I see the picture, I do like it much better. Just in case I didn't like it, I found this beautiful piece of linen knit I also purchased from Fabric Mart and decided to make another cardigan from McCall's 6708. The colors are PERFECT together and I think the pink in the linen knit compliments all the color in the dress. I do like the textures together as well, it isn't quite as busy but still pretty, pretty, pretty! With the amount of stretch that both knits had, I decided to give it some special care, just so everything came together well. For the neckline on the dress, I staystitched it first. 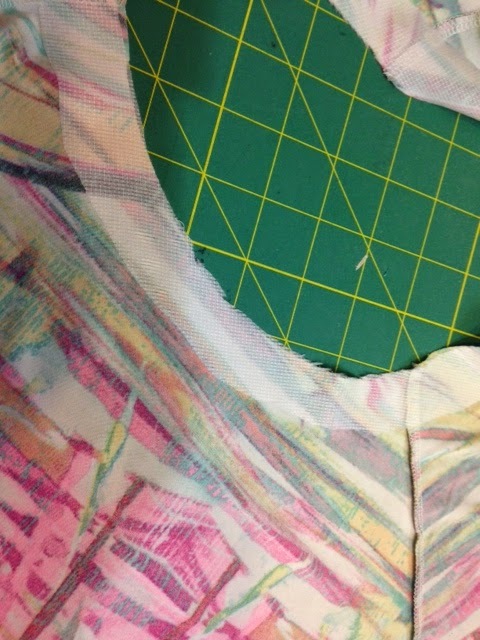 Next, I cut interfacing that matched the neckline curve both front and back and fused it on. After that, it was time to attach the neckline, which I did cut slightly narrower than called for with this pattern. I simply serged it, turned and topstitched on the right side. It lays well and again, the fabric behaved perfectly. For the hemlines, I decided to use one inch strips of interfacing that I fused and then used a double row of topstiching to ensure the hem never falls out. It also kept the stitching nice and even and flat. Another thing to think about when sewing with knits is to sew all in the same direction. So for example, if you sew from the armhole to the neckline on one side, you should do it on both sides, otherwise things can get pretty wonky as one side can end up a lot longer than the other--not a good thing to happen to your lovely fabric or garment! Also, I make sure I check how my knit is feeding through the serger, if I need to adjust the differential feed, I do. Sometimes I need to adjust the pressure on the presser foot as well to get things to feed evenly and achieve a straight seam. I am very pleased with my new dress and I do love both of my cardigans! Very pretty, Sue! I really love that fabric, and the colors work great with your cardigans. Fabulous dress, I love the fabric. I especially like it worn with the pink cardigan.